What is a Native Seed Collection Event? Think of a native seed collection event as a widespread, volunteer-led environmental scavenger hunt—fun for you, but critical to the health of the rivers and streams around you. A native seed collection event is a volunteer seed collection designed to encourage individuals, families, grassroots citizen groups, clubs, students, government employees, and corporate groups to learn about the important connection between healthy, forested lands and clean waters. Collected seeds are donated to state nursery farms, where they are nurtured and transplanted for use in stream- and river-side reforestation. A native seed collection event is a wonderful vehicle for raising public awareness about conservation issues. Over the long term, the newly planted trees will improve air and water quality and wildlife habitat throughout the Potomac River watershed, thereby enhancing the region’s quality of life. Why Should I Organize a Native Seed Collection Event? A native seed collection event addresses a critical need for native hardwood seed at our state nurseries, highlights the important connection between land use and water quality, and educates people in a fun hands-on watershed conservation activity. Healthy trees are critical to human well-being and wildlife prosperity. Trees cool our cities, filter the air we breathe, provide homes and food for wildlife, and support water-related recreational activities. Their leaves produce life-giving oxygen, and their roots reduce soil erosion and absorb pollutants that would otherwise foul our rivers and streams. Their branches and trunks are home to a many of the birds and mammals that we cherish. Native trees are especially important because they are adapted to local soil, rainfall, and temperature conditions, and they have developed natural defenses to withstand many types of insects and diseases. Because of these traits, native plants thrive with a minimal amount of maintenance. Wildlife species depend on native plant communities for their habitat, so native trees help preserve the balance of nature. Plants and trees that are imported from other parts of the nation and the world can actually bring unintended harm, resulting in diminished wildlife and plant diversity. According to American Forests, a world leader in forest restoration, America’s cities have a deficit of 634 million trees. In the mid-Atlantic region, the overall tree canopy continues to decline and at the same time, areas with little or no tree cover continue to increase. Replanting native trees and reforestation is the answer, and you can help! In the heavily urbanized counties of the Washington, DC metropolitan area, non-point source pollution is the greatest threat to water quality. Runoff from streets and farms contributes sediment, nutrients, and other toxins to our waterways. Moreover, this runoff accelerates the erosion of stream banks and causes sedimentation in the Potomac River, and ultimately, the Chesapeake Bay. A significant amount of this runoff originates from individual yards and homes. Native seed collection events are very easy to budget because they are generally cheap or free! Coming up with the funds to put on a native seed collection event should be pretty easy; however setting your goals may be a little more difficult. You could be simply collecting acorns to help your state’s nurseries with their seed harvest for tree planting along riparian buffers, or you could be starting a seed grow out station so that you can do your own planting in your watershed. You may have in mind to collect seeds from one tree, or one site, or you may want to encourage your watershed’s residents to collect their own seeds. Whatever the case, you will want to write out your specific goals and let them guide your work plan. To get students and citizens outside and appreciating the beauty and majesty of their watershed. To empower citizens to get involved with restoring their watershed through simple acts such as native seed collections. To educate students and homeowners about the connection between trees and water quality and encourage them to help increase forest canopy cover in your watershed. The cost associated with putting on a native seed collection event can be as low as the cost of your time. Seed collection events provide excellent publicity and businesses are often willing to cover the costs of necessary items. Flyers – As little as $0.03 a copy (black and white). The cost can vary depending on how many you create and if you decide to use color. Seed collection bags or boxes – You can re-use grocery bags or boxes or purchase special seed bags that are breathable to allow the seeds to remain cool and moist. Food and drinks – Again it depends on the number of participants and how extravagant you want to be. Often water, donuts, coffee, and juice will suffice. Gloves, and safety vests – These are optional items. You can ask participants to bring their own gloves. Safety vests cost about $5.00-10.00 a piece. First aid kits – A good kit runs approximately $20.00. Because it does not cost a lot of money to put together a native seed collection event, you may not require any help in financing your work. If you are interested in getting some help to accomplish your goals, there are a lot of places to look for it. 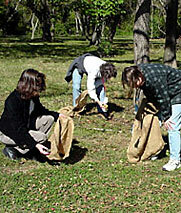 The Potomac Conservancy and the Potomac Watershed Partnership organized the first wide-spread volunteer seed collections through a program called “Growing Native.” They organize seed collections every fall and can provide support in terms of banners, collection bags, collection tags, and seed drop off locations. Local business people, club leaders, and government officials. Ask them to give what they can: cash, equipment, supplies, or services. Collecting bags and boxes are a must and can often be obtained as “in-kind” donations from grocery or supply companies. Food and drinks for the workers are essential and can usually be obtained through donations. Restaurants and local grocery stores might give you refreshments. Don’t forget first aid. The local fire department, Red Cross, or other emergency medical personnel may be willing to donate first aid kits and supplies but you probably already have all the first aid supplies you need in your home. Establish an organizing committee: a core group of individuals dedicated to organizing and implementing the seed collection. This group will be charged with determining the location and date of the event and in the logistics of planning the seed collection. Where is there an area where the desired native hardwood tree species grow? Is the area big enough to host all of your volunteers? Ecological considerations, permitting, land rights, and geography will determine where you collect. The goal is to increase diversity and improve healthy streamside forests — not to interfere with balanced ecosystems. You may consider focusing on areas of special need: communities working for environmental justice, high impact areas, land with ecological diversity, historic farmland, agricultural communities, or preserves. Some of the best group collection locations are the least obvious. Water treatment facilities often have large reservoirs with healthy old trees, and power companies have large land holdings often with acreage that they rarely use. Local Departments of Public Works have access to many of the right-of-ways along neighborhood streets and parklands, and Department of Defense facilities have bases with many old trees. Churches, cemeteries, schools, neighborhood parks, and highway rest stops are prime areas for collections. Your own back yard can be a great collection area too. The key to finding a good collection site is keeping your eyes open and looking for old, well-established trees. You will be surprised what you find once you start looking! Whether you are collecting on public or private lands, you will need permission. Landowners usually respond well to the idea, and often ask if this will be an annual event! The question of when you are going to collect seeds is as important as determining where you are going to collect the seeds. Native seed collection events generally take place throughout October because most trees in our area drop seeds during that time. When and where you collect will depend on the species you choose, as different trees drop their seeds at different times. For example, pawpaw fruits should be picked from the tree in early September, but black walnuts should be collected after they fall in late October or early November. A single tree will also vary from year to year in the amount of seed it yields. Your community forestry professional will be the best person to help you pick the most appropriate date for your event. Try to determine the event date 8 to 10 weeks before it will take place. Typically, Saturday mornings are the best time to schedule an event. Be careful to avoid a holiday weekend or a weekend when the switch is made to and from Daylight Savings Time. The organizing committee should also allow adequate time for project planning and volunteer recruitment. If equipment will be borrowed, the organizing committee should make these arrangements first, and select a day when the equipment is available. Remember to establish a rain date! A seed collection event typically lasts about three hours. The organizing committee should also plan an additional half-hour before the event for setup and a half-hour afterwards for cleanup. Additional time may be required after the event, if a picnic or barbecue is planned. Obtain written permission from landowners with property at the proposed seed collection site. Venturing onto private property without permission is trespassing; you may be subject to arrest. The organizing committee should invite the property owner to participate in the collection. If the property owner cannot participate, the organizing committee should obtain written permission for volunteers to collect seeds from their land. If you are unsure of the landowner, county tax maps, located in county planning offices, can provide property ownership information. The organizing committee can also determine the property owner by talking to people who live close by. Before sending the collection teams out, the organizing committee should emphasize the importance of staying on public property and public roads, except where express permission has been given by the property owner. 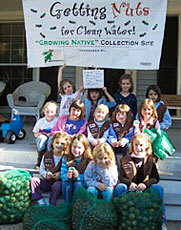 Recruit seed collection volunteers from your local community. Anyone can assist in a native seed collection project. Children under the age of 18 years should be encouraged to participate but should have permission from parent or guardian. The organizing committee should provide adequate supervision: one adult supervisor for every six children. Group size depends on the number of trees and area of land at your collection site. A collection could involve anywhere between one and 50 people. Consider the number of volunteers you can effectively manage and still ensure the enjoyment of all. Initiate volunteer recruitment approximately 6 weeks prior to the project date. We recommend contacting groups via telephone and getting an announcement posted on email listservs. Event calendars (including church and organizational bulletins) and word of mouth are also effective. As a rule, 50 percent of those people who initially sign up for an event will not actually participate. For this reason, the organizing committee should recruit twice as many people that will be needed for the project. The organizing committee should establish a phone number (contact person) or email address whom volunteers can contact to register for the event. When volunteers register, get their names, addresses and telephone numbers. As volunteers respond to recruitment activities, members of the organizing committee should advise them on what to bring and how to dress. Recommend that volunteers wear sturdy shoes or boots, clothing that they don’t mind getting dirty, work gloves, and a hat or outerwear as the weather dictates. Volunteers should also be encouraged to use sunscreen and insect repellant. The organizing committee should recruit, from the volunteer labor force, several field supervisors or site captains who will assist volunteers during the collection event. Approximately one supervisor should be recruited for every 10 volunteers. The organizing committee should host a training session for these supervisors prior to the project date, so that their role can be defined. The organizing committee should send reminders of the date (and rain date) and time of the event, as well as maps showing the location of the central meeting place to all registered volunteers one week before the event. If time allows, committee members may also call the volunteers a few days before the event to confirm participation in the seed collection. Advertise the native seed collection project. Event publicity should complement your volunteer recruitment efforts by drafting, reproducing, and distributing fliers; drafting and distributing press releases to local newspapers and/or organizational newsletters, and offering presentations at group meetings. Recruitment messages should include the name, day, date and starting time of the event, the rain date, location and directions to the central meeting place, name of the adopting group or organization, and a contact’s name, phone number, and email address. Use direct mail for members of the adopting group or organization and similar groups. This type of targeted mailing will be more fruitful than a mailing to a “cold list” – individuals who may not be familiar with your activities. Have a phone number or email address that volunteers can contact to register and include the information in all advertisements. Refreshments are one way to thank volunteers for their valuable time and hard work. It is recommended that the project sponsor provide non-alcoholic beverages. If beverages will not be provided, the organizing committee should encourage participants to bring their own. Simple refreshments (coffee and doughnuts, cookies and punch) may be offered during registration, or as a time for volunteers to celebrate a job well done at day’s-end. A picnic or barbecue are also nice ways to thank volunteers. Local businesses and/or the volunteers themselves (pot-luck) may be willing to donate food/drink, coolers, cups, ice, paper goods, etc. The organizing committee could also consider providing rewards, such as certificates, bumper stickers, tote bags, caps or t-shirts. The committee may solicit contributions, both monetary and in-kind services, from local businesses. As soon as you have scheduled your seed collection and created your materials, it is a good idea to schedule a volunteer team leader training. Keep your training brief, informative, and fun. Be sure to cover safety, liability, seed identification, collection protocol, and seed delivery. When your volunteers have arrived, break them up into groups to work with a team leader. The team leader will work with the volunteers to ensure the correct seeds are collected and that they are well sorted into their collection bags or boxes. Provide a sign-in sheet for volunteers at the central meeting place on the day of the event. The sheet should include spaces for the volunteer’s name, address, phone number, and email address. (Remember to provide pencils or pens.) Volunteers who have not completed and signed a safety liability release form must do so before participating in the seed collection. Nametags will help volunteers get to know each other. Also think about introducing the event and making the connection between the day’s work and the health of your local waterway, aquatic life and drinking water. Many people have an interest in their local streams but don’t understand much about river systems. You may wish to provide a map of your local waterway so that people can orient themselves in the watershed and make the visual connection between their home and the river. Pass out tree/seed identification materials and maps to the collection sites or specific trees. Also hand out the collection bags and provide each team leader with identification tags or permanent markers for each bag. Educate the team leaders and all the volunteers on sorting and bagging their seeds. Emphasize that if they do not follow these steps, the nurseries may have to dispose of their seeds. When collecting fruit such as paw paw or walnuts, discard the outer flesh and collect only the inner seed. Flesh will decompose in bags and cause seeds to spoil. If collecting acorns, take a small sample of nuts and place them in a container of water. If the majority sink, your seeds are good to go to the nursery. If the majority float, your seeds may be unhealthy due to pests, decay, or dryness. Float test some more seeds, and if they all float, try collecting from another tree or location. Make your native seed collection event as enjoyable as possible for volunteers. Consider providing music—a local band willing to play at the site or even a portable radio or two can lighten the mood and turn the work into an enjoyable event. Locate a convenient shady spot where workers can rest, and provide seating and refreshments. Plenty of drinking water is a must, and local restaurants or grocery stores may be willing to donate ice, juices, soft drinks, or snacks. Allow time at the end of the day for participants to relax, socialize, and enjoy the fruits of their labor. Take the time to weigh the seeds. By weighing the seeds collected you are not only providing valuable information to the state forestry nurseries, you are letting your volunteers know how successful they were. After determining the weight of all of your seeds, you can extrapolate the number of seeds you collected if you know the weight of an average seed of that species. If you have a large collection site, it may be easier to provide information on the number of bags collected rather than their weight. After the volunteers have finished collecting the seeds, the work is not over. You or your team leaders need to tag your bags and deliver them to the nearest drop off site. The bag tag includes information on the location of your collection site, the tree species, and the weight of the bag. This information is very important for the nursery employees. If you don’t have tags, you can find them at a local drop-off site. As soon as is possible after the seed collection, drop off your seeds at the closest state nursery or seed drop off location. Potomac Conservancy provides a list of drop-off sites. Call in advance to ensure they are accepting seeds this year. When you arrive at the drop-off station, if you do not have a breathable bag, transfer your seed to the white mesh bags provided. Be sure to place each different species in its own bag. Do not include debris—except for one leaf and stem for identification purposes—in the bags. If you have not already done so, fill out one identification tag for each bag. This information is very important to the nursery employees. Then tie the tag securely to the bag and put the seed bag in the drop-off box. If you are unable to drop off your nuts for a few days, follow these procedures to make sure that your seeds remain viable. The two most critical components for caring for nuts are 1) do not allow the nuts to dry out for an extended period and 2) do not allow them to heat up. Seeds will lose their viability, or ability to germinate, very quickly if allowed to dry out extensively. Therefore, it is important that once they are collected from the tree or fall from the tree that they are kept moist until time to place in seedbeds. For these reasons it is best to store seeds in bags or boxes that somewhat inhibit drying of the acorns but also allow air to flow through the bags to prevent heat buildup. The best storage bags to use are either burlap bags or the special plastic bags that are ventilated to prevent heat buildup. Using solid plastic bags that are poorly ventilated will preserve moisture but also will not allow heat to escape. A hot moist environment will cause the nuts to spoil very quickly whereas a cool moist environment is ideal for seed storage. The seeds should not be allowed to stay in bags that hold standing water for over a few hours. The seeds that are collected should be placed in the bags and kept as cool as possible in a shady location until routed to the nursery. If room is available, a refrigerator will work fine but DO NOT FREEZE THE SEEDS. The bags should be wet down periodically to keep them from drying out. It is preferable that the bags of seeds be routed to the nursery within 7 to 10 days after being collected. After the seed collection event, please remember to collect copies of the sign-in sheets and all completed and signed safety liability release forms. Use this information to generate certificates of appreciation for each volunteer and organization involved in the event. You can also compile the information into a community database of individuals and organizations to facilitate networking among groups and individuals interested in water quality issues. Arrange for photos to be taken before, during, and after the event and publish them along with the totals. Contact the local media who helped you advertise before the seed collection and share your results. Also contact the event sponsors sending them a thank-you and the results of the event. Be sure to recognize everyone in the community who made your success possible. When the event is completed, it is important to evaluate what you accomplished. It will help future planners to capitalize on your successes and avoid your mistakes. But you can’t wait until the end of the event to think about evaluation. An evaluation committee should be chosen in the planning stage to monitor the entire sequence of events, noting what worked well and what went wrong. Poll your volunteers as they leave, either by providing a questionnaire or by simply having the team leaders ask their crews what they thought of the event. Within a week, get your committee together and make a list of what went well, what needed improvement, and what, if anything, failed completely. What problems did they have? What would they do to improve future events? The evaluation committee should compile a final report of what they’ve learned. With this report, you’ll be well on your way toward an even more successful seed collection next year.